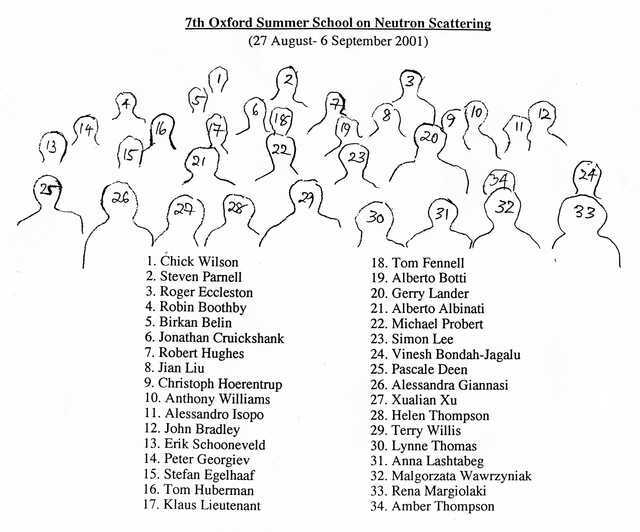 Participants at the 7th Oxford Summer School on Neutron Scattering. A separate identification key is available. The legend gives the following names: 1 Chick Wilson, 2 Steven Parnell, 3 Roger Eccleston, 4 Robin Boothby, 5 Birkin Belin, 6 Jonathan Cruickshank, 7 Robert Hughes, 8 Jian Liu, 9 Christop Hoerentrup, 10 Anthony Williams, 11 Alessandro Isopo, 12 John Bradley, 13 Erik Schooneveld, 14 Peter Georgiev, 15 Stefan Egelhaaf, 16 Tome Huberman, 17 Klaus Lieutenant, 18 Tom Fennell, 19 Alberto Botti, 20 Gerry Lander, 21 Alberto Albinati, 22 Michael Probert, 23 Simon Lee, 24 Vinesh Bondah-Jagalu, 25 Pascale Deen, 26 Alessandra Giannasi, 27 Xualian Xu, 28 Helen Thompson, 29 Terry Willis, 30 Lynne Thomas, 31 Anna Lashtabeg, 32 Malgorzata Wawrzyniak, 33 Rena Margiolaki, 34 Amber Thompson. 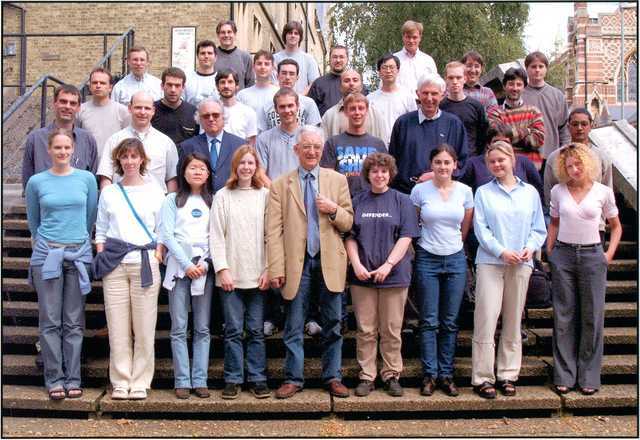 Identification key for participants at the 7th Oxford Summer School on Neutron Scattering.